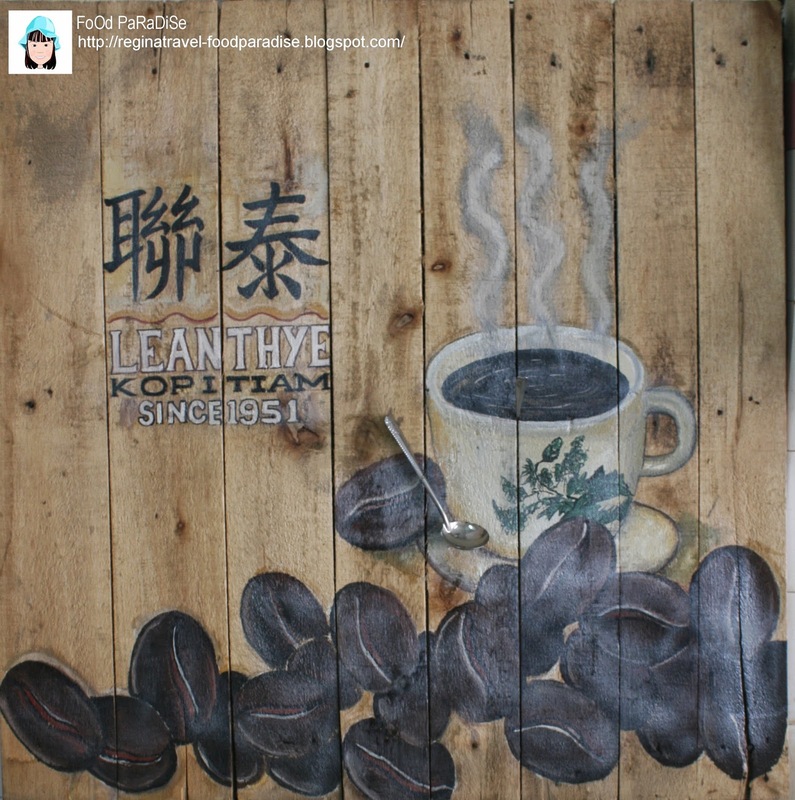 Lean Thye Kopitiam @ Lebuh Ah Quee, Penang. Some of you might already try this lor mee before but for me this is the first time. I passed by many times over the years. Almost full house each time I passed this shop. The painting above caught my attention the moment I walked in, so I straight away order a hot kopi "O" when the auntie asked me what to drink. Sugars are provided on each table, which is good as you can add to your preference. 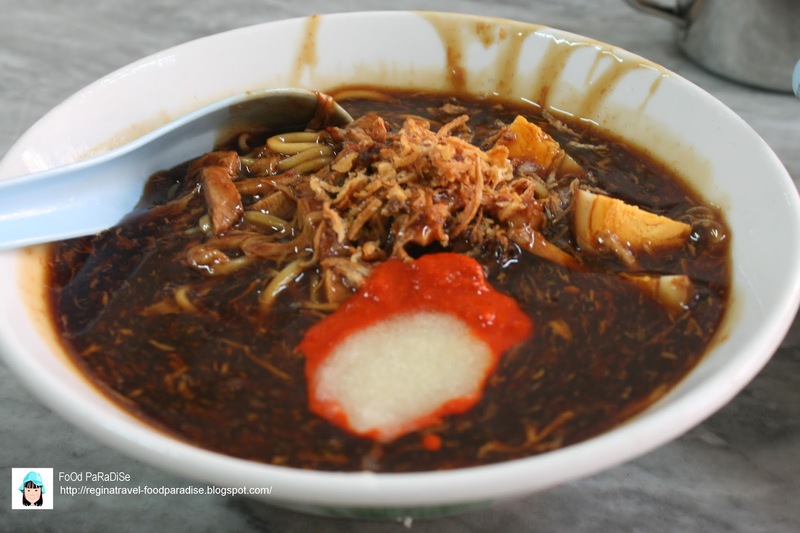 The gravy of the lor mee served here is very thick and full of aroma. You can add extra duck egg, pork and pork skin with extra charges. The chili and garlic pastes are on each table for you to add to your bowl of lor mee according to your liking. The shop closed on every Sunday. The Lor Mee for small served costs RM3.50 and the large serve costs RM4. 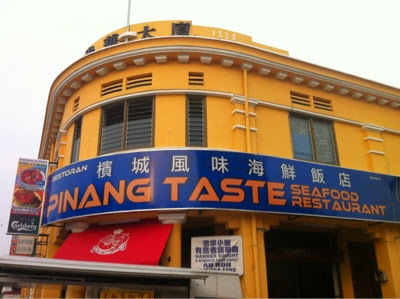 Mackerel Curry Fish Noodles @ Pinang Taste Seafood Restaurant- Lebuh Carnorvan, Penang. 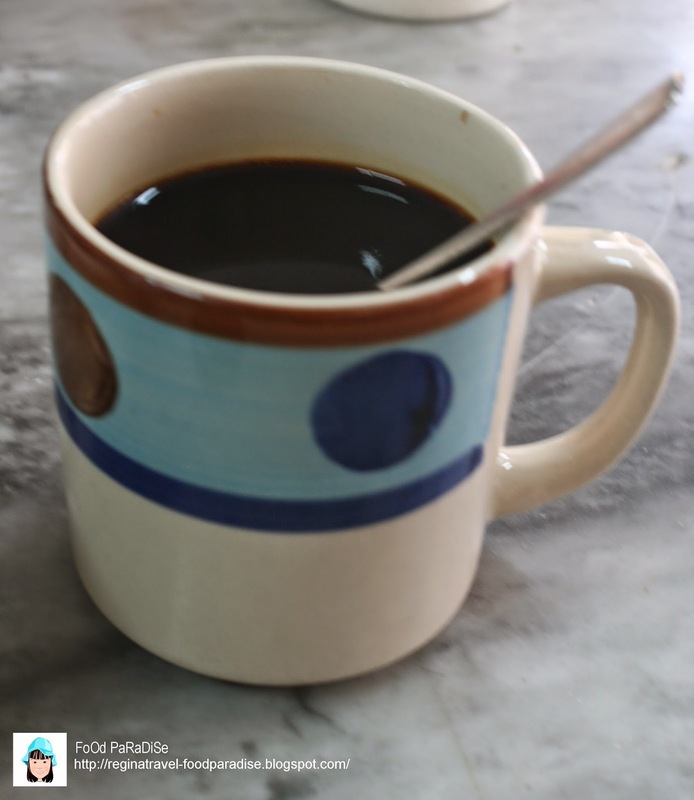 While walking around Penang two weeks ago, we stumbled across this coffee shop while we were making a u - turn since the street was occupied with the morning markets. 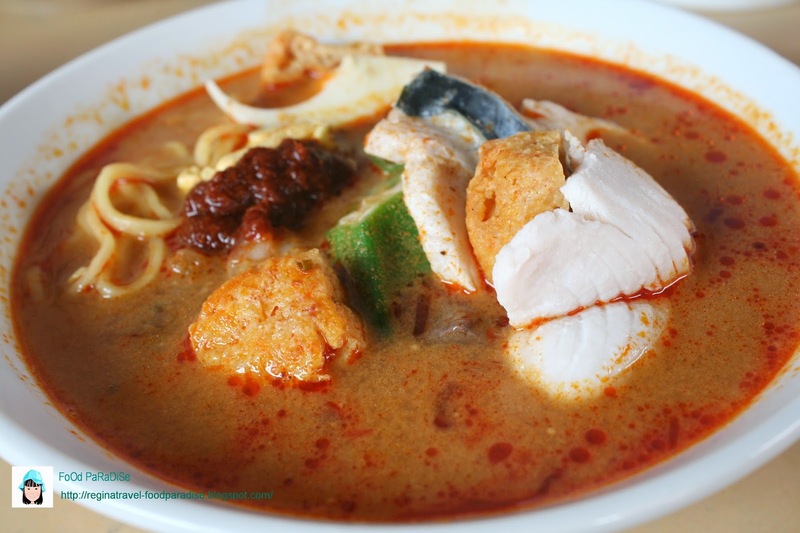 The big red sign of Mackerel Curry Noodles catches our attention. So we decided to give this a try in our next food hunting trip. According to the uncle, they just barely open for less than 2 months. 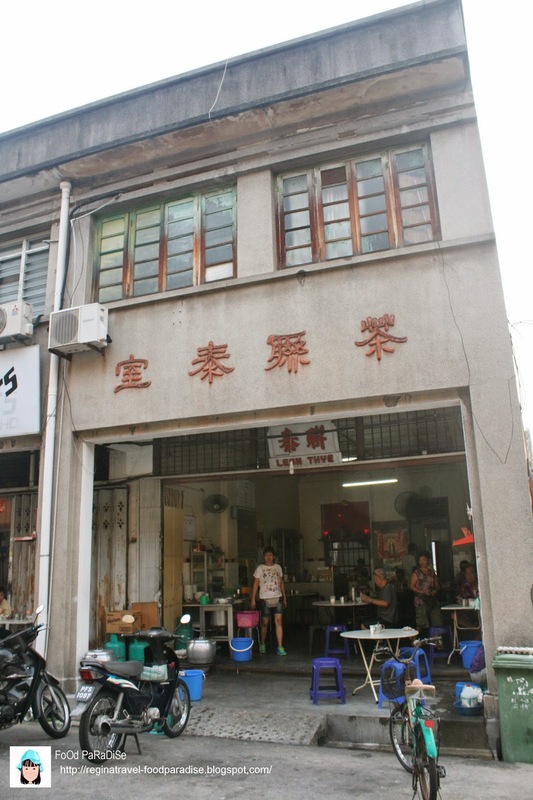 It is just located few shops away from Restoran Aik Hoe. The mackerel being served in this bowl of curry noodles is very fresh. They did not deep fried it. Mostly I will have the deep fried mackerel fish. This is actually my first time trying the poached mackerel. 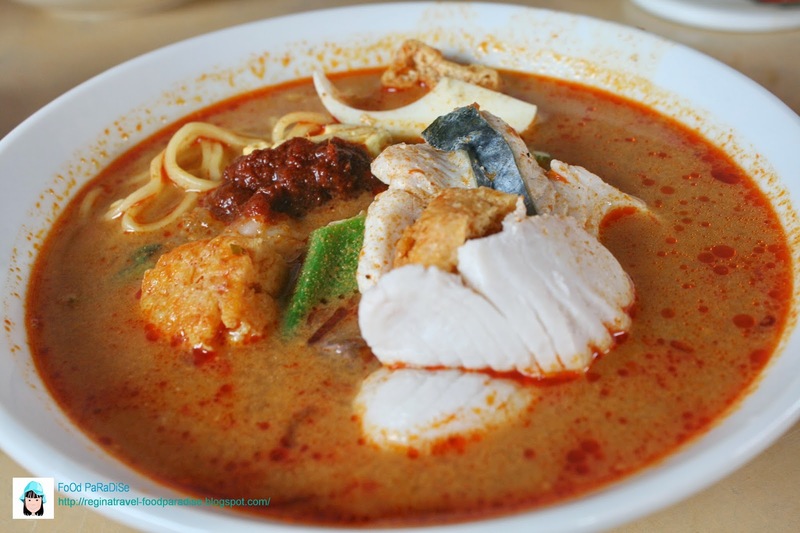 Due to the freshness from the fish, it actually makes the bowl of Curry Mee more unique. On the table itself, they have a small containers filled with chilli paste. You can add the amount of chilli according to your tastes. The curry mee per bowl with the mackerel cost around RM6. 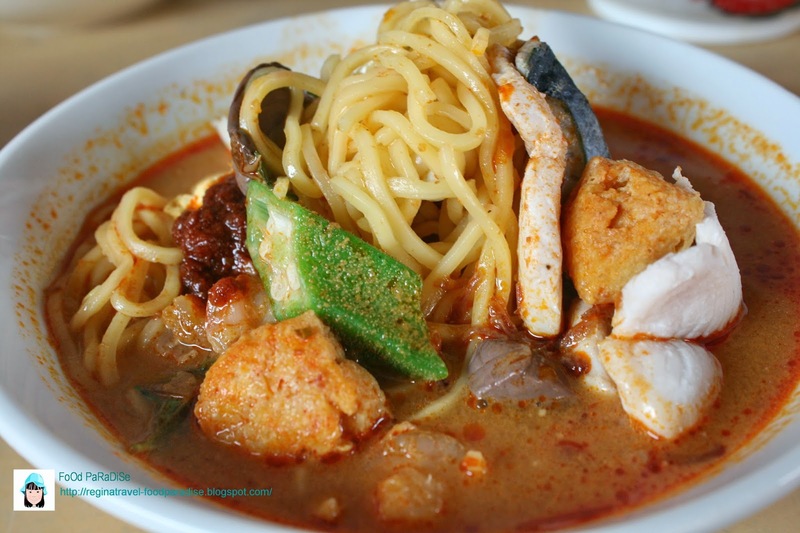 They do sell curry mee without mackerel though. Just the standard curry Mee. Do you remember when is the "FATHER's DAY" for this year? This year the Father's Day for Malaysia falls on 15.06.2014. Have you got any plans for the "Father's Day" celebration yet? 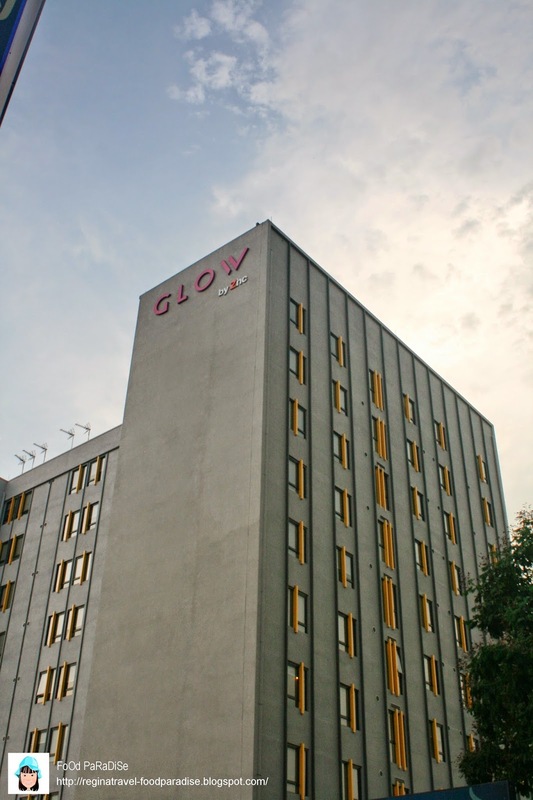 Address: 101, Jalan Macalister, 11400 Penang, Malaysia. I enjoyed the starter very much. Basically, it has two pieces of grilled prawn top with caviar and cream. 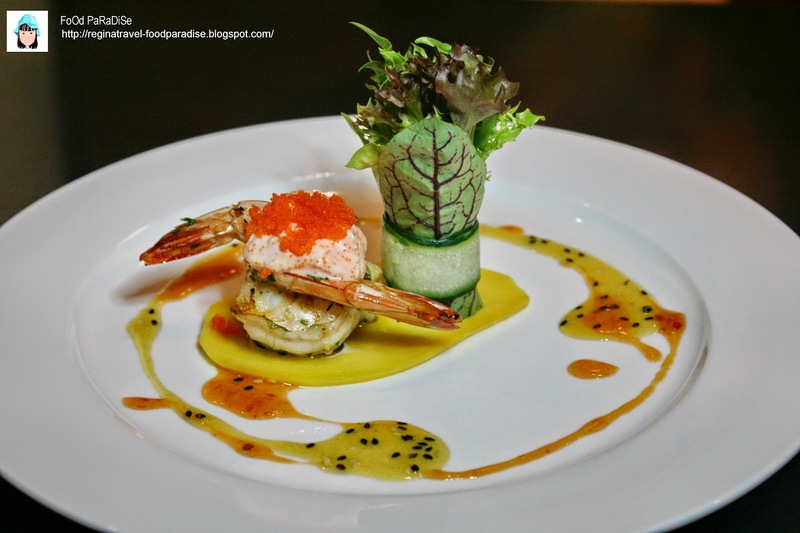 The bottom of the grilled prawn is presented with thinly slice of mango. The salad roll is wrap with thinly slice of cucumber. The sauces use for decoration of the plate are mustard with honey and Thai chilli sauce. As a mango lovers, I love this starter. 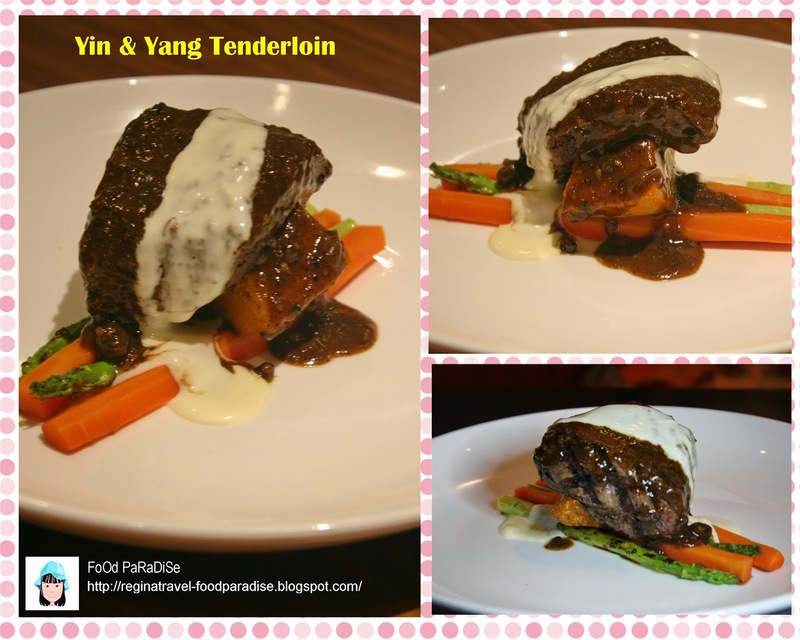 Grilled beef tenderloin with black and white Sauce. 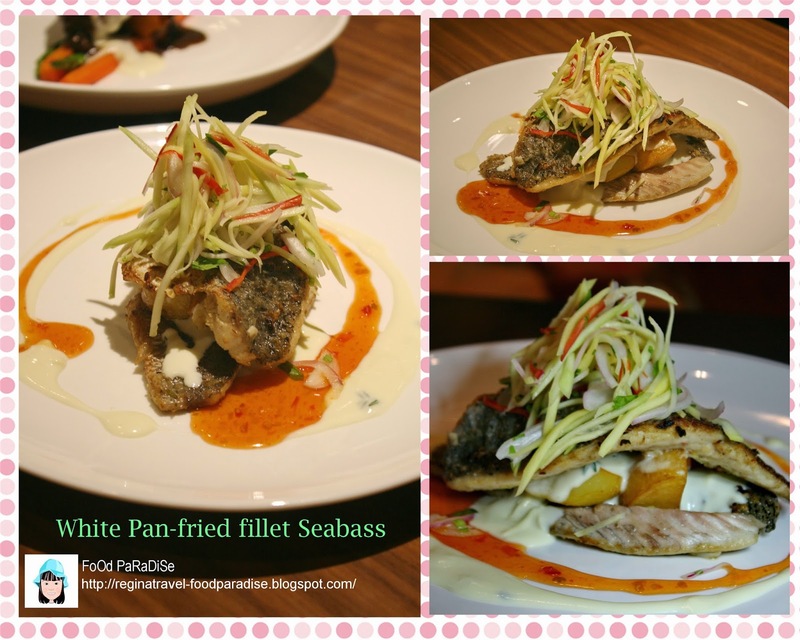 Grilled Seabass with Bechamel Sauce. The main course is quite a big portion for me. Quite full after finishing it. Apart from the grilled sea bass, it came with the dice potato and some thinly slice mangoes, onion and chilies. Although I am full. But desserts are always irresistible. Hahaha........ This desserts are quite special. 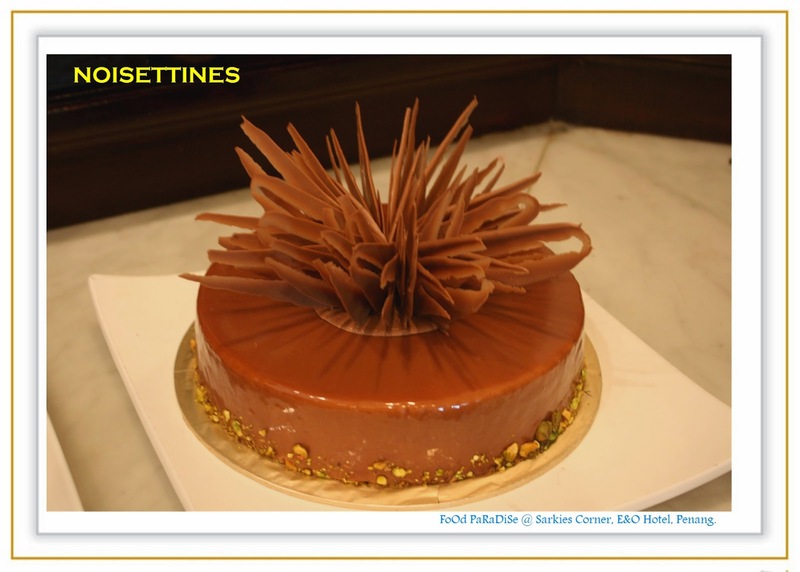 It is covered with roasted pistachio and chocolate for the first layer then the avocado cream layer, follow by a layer of chocolate layer and end with cream layer. It is quite rich but I love it. 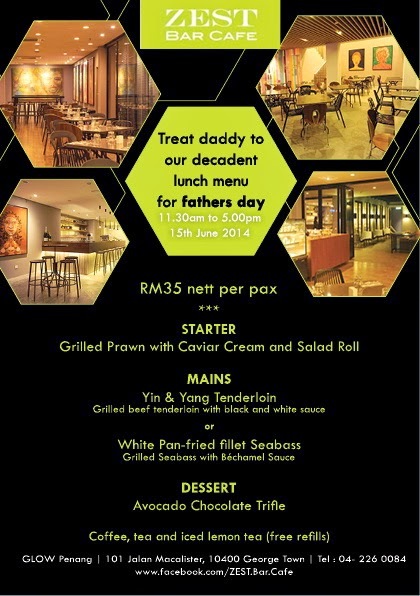 If you order the Father's Day set menu, you can have free refill of either coffee/Tea or Iced Lemon Tea. Not only that, you can also order Caffe Latte or Cappuccino (Free Refill) as well. FoOd PaRaDiSe verdict: This set lunch is worth for value and they are very generous in term of the food portions that they given. Not to forget, free refill of drinks. 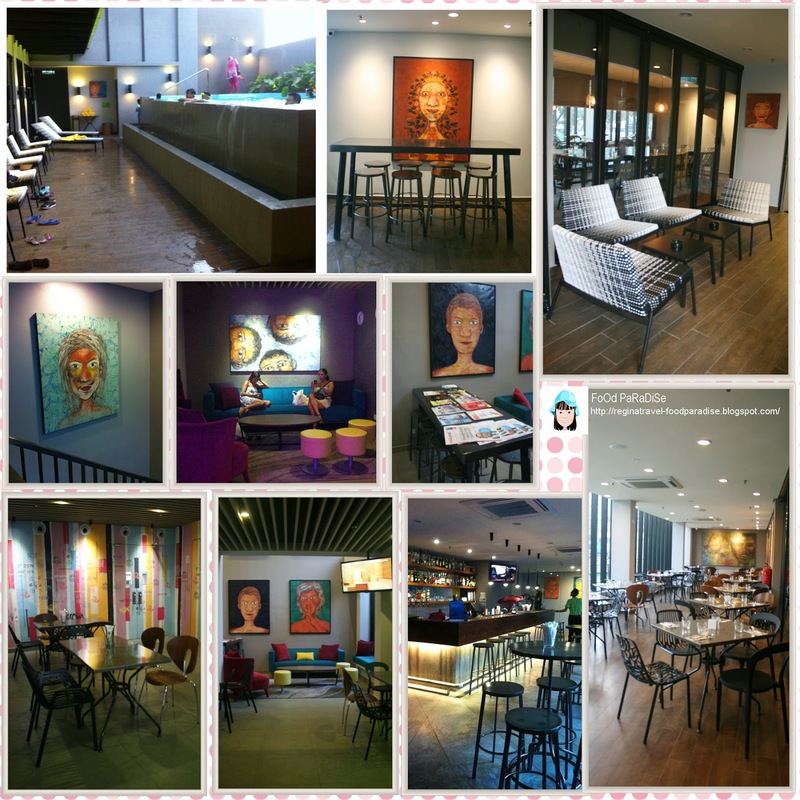 They have a meeting rooms @ ZEST BAR CAFE. 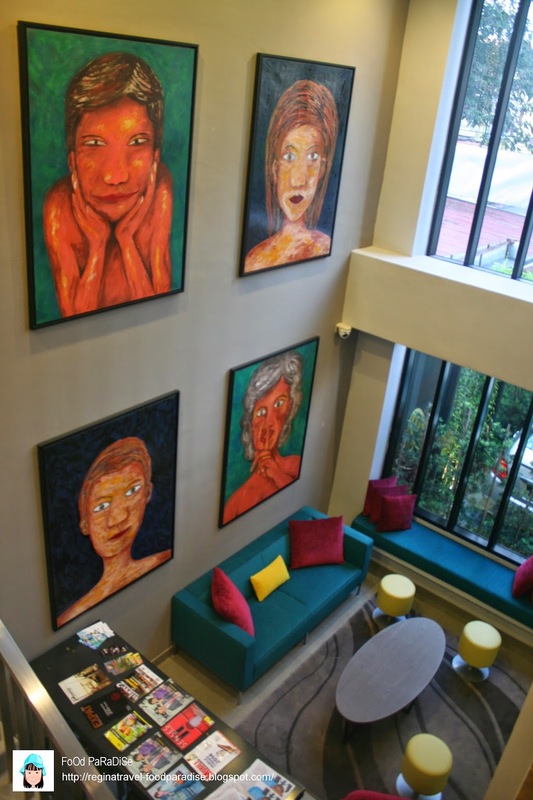 If you would like to hold a meeting or some function you can come over to ZEST BAR CAFE. The meeting room does not need any booking fees at all. 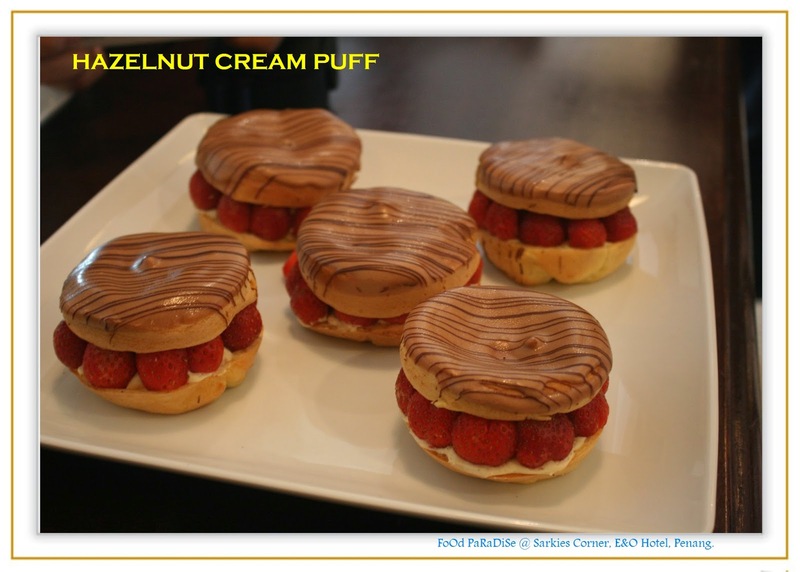 What you need to do is just need to dine in @ ZEST BAR CAFE. Furthermore, there will be no extra charges if you need to use the white board or projector. It is advised that you give them a call if you need to use the meeting room to avoid any disappointment. 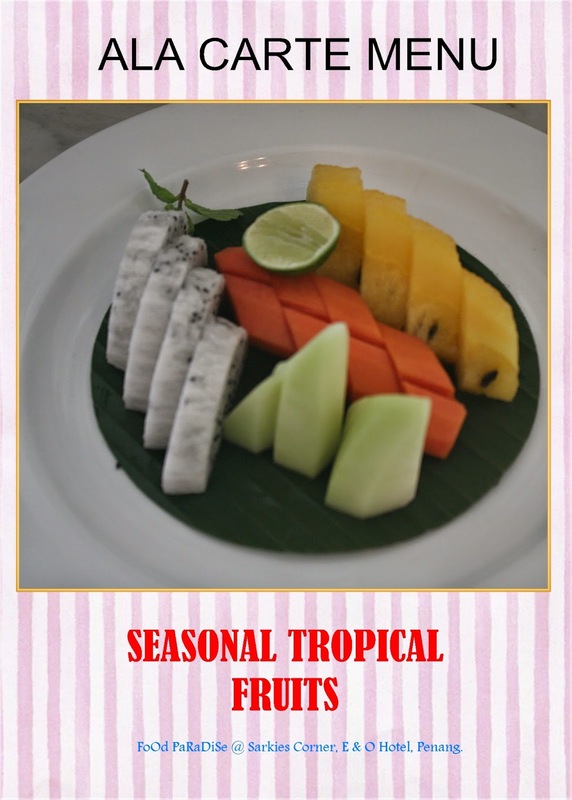 Ramadhan Buffet can be arranged for groups with a minimum of 30pax booking. Please contact +6017-4882108 for further information. They will be having jockey parking services start from 1st July 2014. They will park the car for you 250-300 metre away from their premises and after you finish your meal, they will provide a mini van sent you back to their parking lots. In the meantime, they have about 10 car park spaces in front of the hotel and 10 car park spaces at the back via Lebuh Naning. To wrap up the blog, I would like to wish all daddy, "Happy Father's Day" in advance. 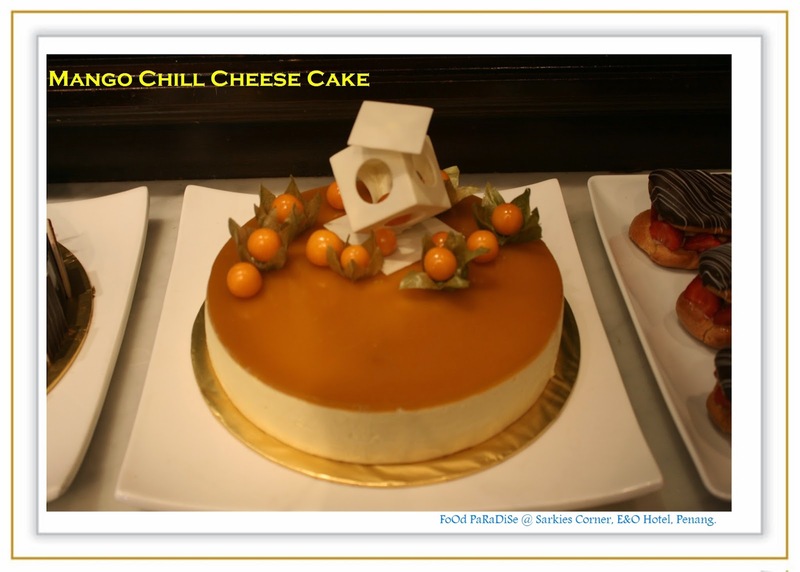 Sarkies Corner @ E & O Hotel, Penang. 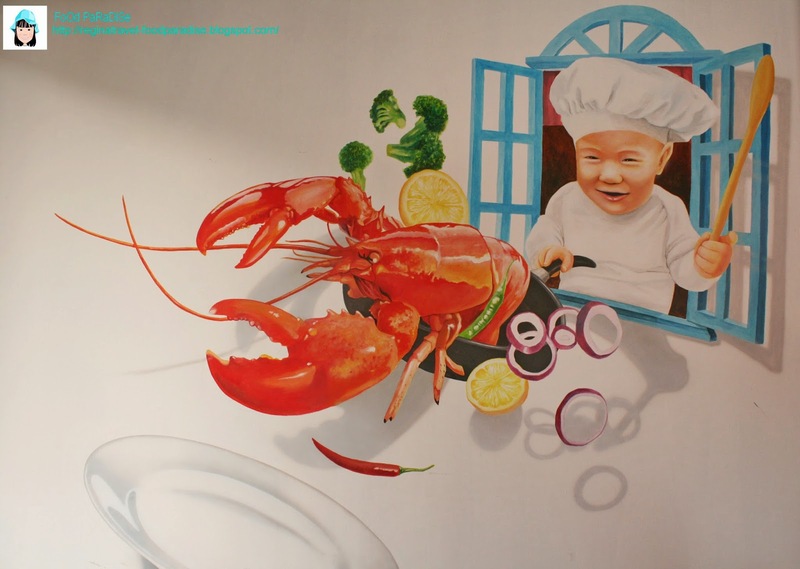 It's been quite a long time that I did not blog about Sarkies Corner. The last time I blog about them was few years back, where their's buffet was still at Sarkies Corner. Review can be viewed here. As for now all the buffets were moved to new wings - Sarkies. Today, I am going to blog about Sarkies Corner. 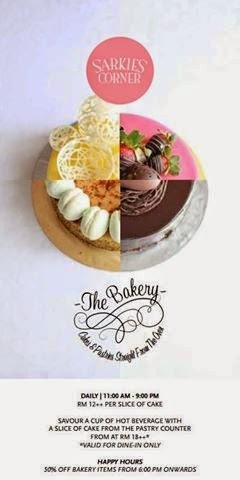 But this time I am going to elaborate more about "The Bakery", Weekend Local Specialties and some of the ala carte menu. 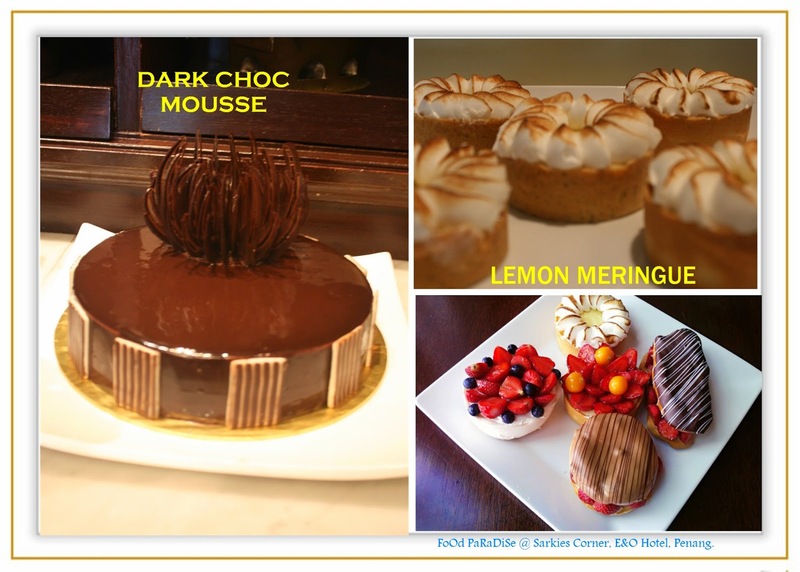 The bakery is just located on your right at the entrance of the Sarkies Corner. It's operates daily from 11:00 am to 9:00pm. What is the special deal for THE BAKERY? Another good news, you get 50% off bakery items from 6pm onwards. Let me show you what kind of cakes, pastries and muffins that are being served from the pastry counter at THE BAKERY during my visit. 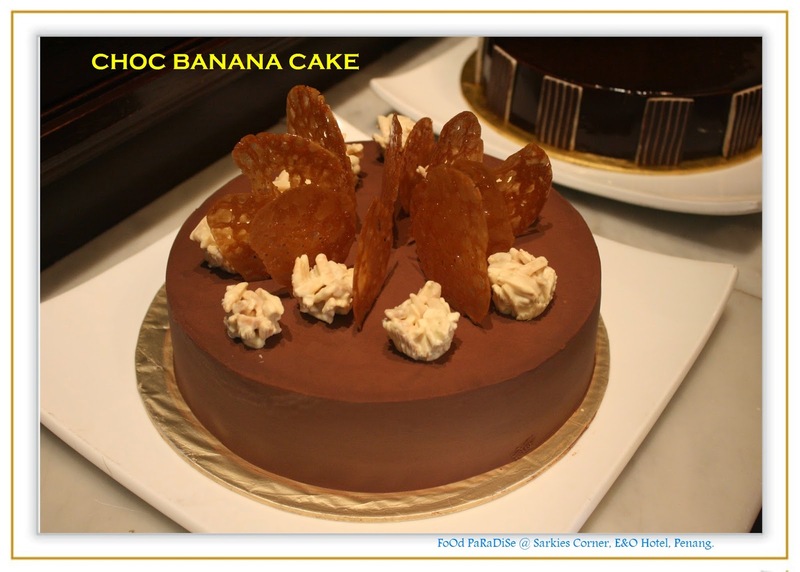 This choc banana cake has a very rich banana flavours. If you are banana lovers, you will love this. The chocolate itself does not really empower the banana flavours. I like the white chocolate coated nuts on top of it. It is very crunchy and nice as well. Their Tiramisu is a bit special. 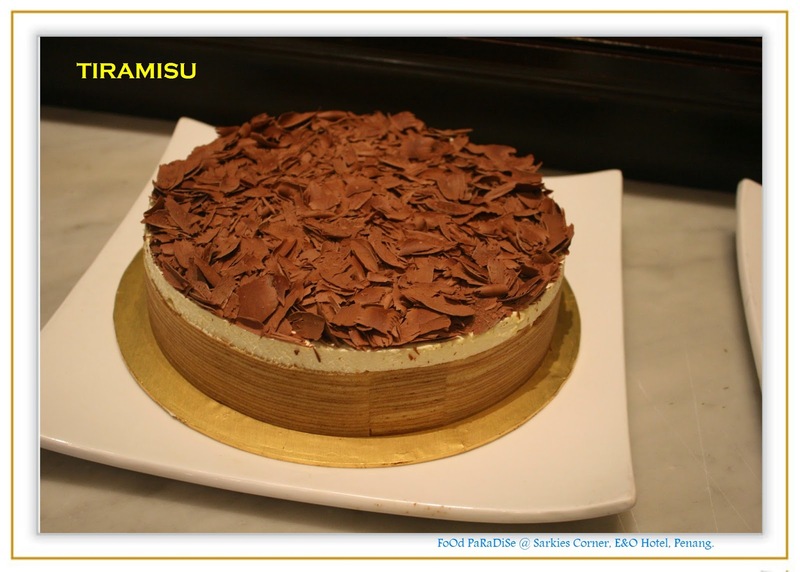 As the outer part of the Tiramisu is cover with layer sponge cake. The layer sponge cake consists of different spices. 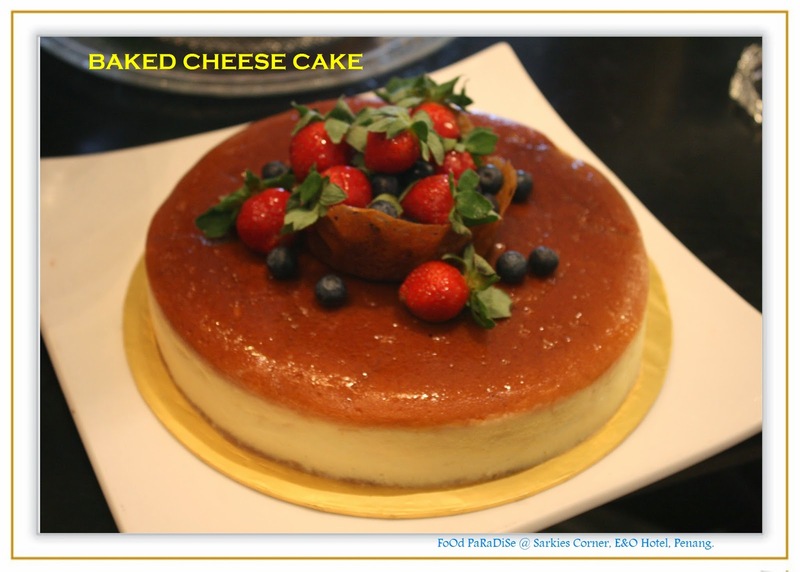 Which remind me about the Indonesia layer cake. Something different and special. The dark choc mousse will attract those who loves dark chocolate. I think I can classify myself as the dark chocolate lover category of person. The chocolate use in this cake is imported from overseas. My gal told me that it is not too bitter nor sweet. She said she loves it. Guess may be can order this for her birthday cake this year. Pavlova......... oh it's been quite sometime that I did not had this. 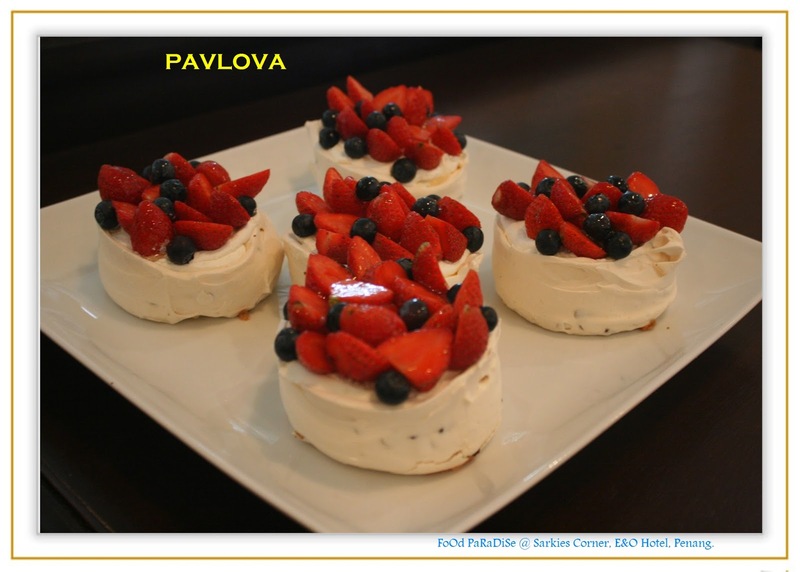 Pavlova always reminds me about my years back in Melbourne. All the memories flew back. This mini Pavlova is quite nice. Give it a try! 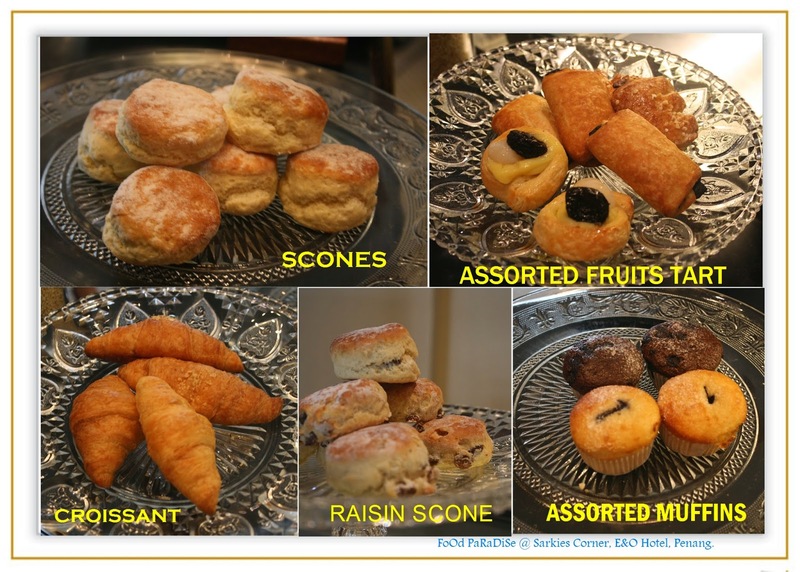 They also served different type of scones, pastries and muffins. You should be able to get something that suits your taste buds here. 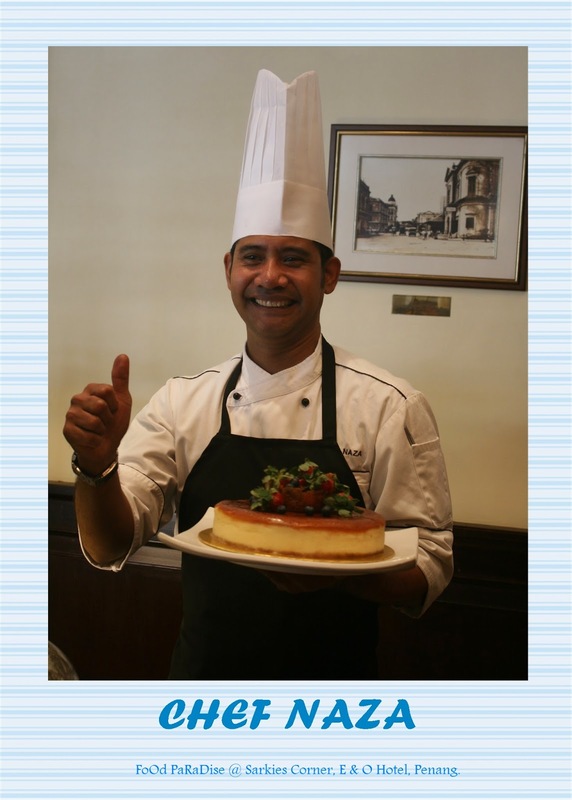 Chef Naza is the chef that bake the above different types of cakes, pastries, muffins, scones and etc. 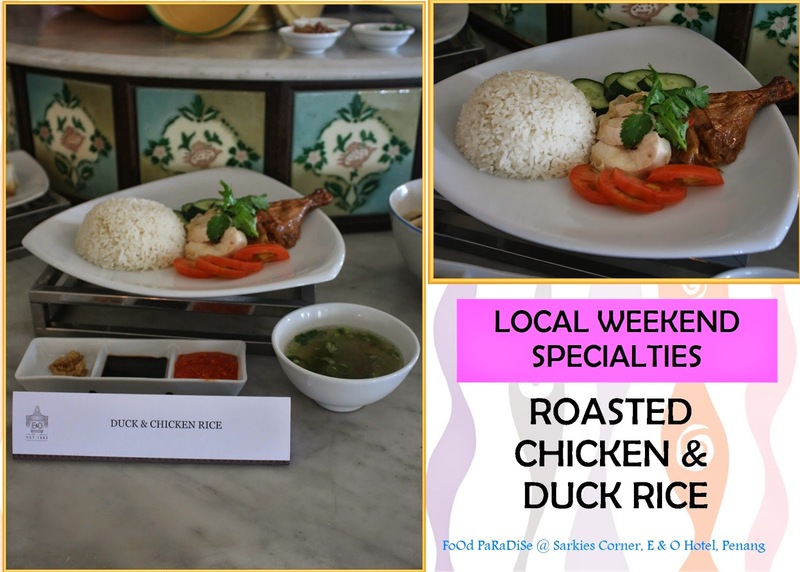 Every week they will have different weekend specialties which I am going to elaborate further in the following post. I am actually not the popiah fan. 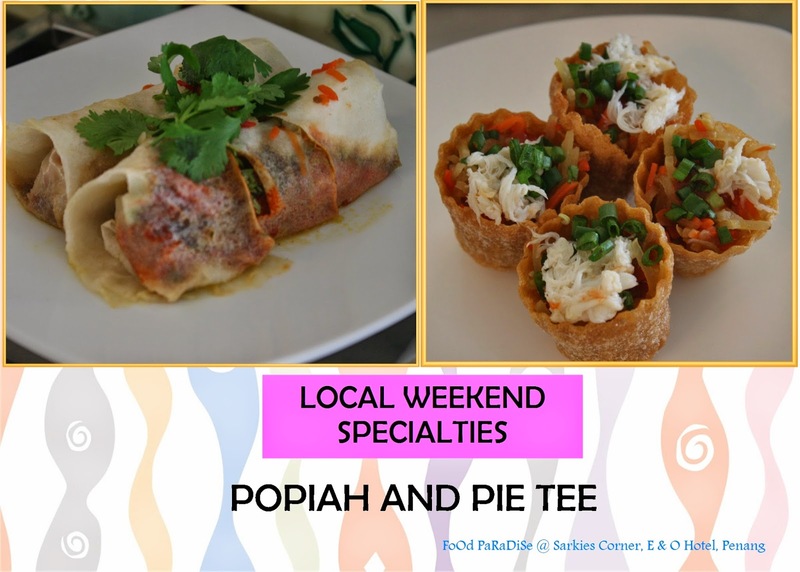 But the popiah is quite nice and as for pie tee, it is very crunchy at the outer part and inside it is very juicy. My friends just put all that into their mouth in one go. They said its nice with the combination at one go. 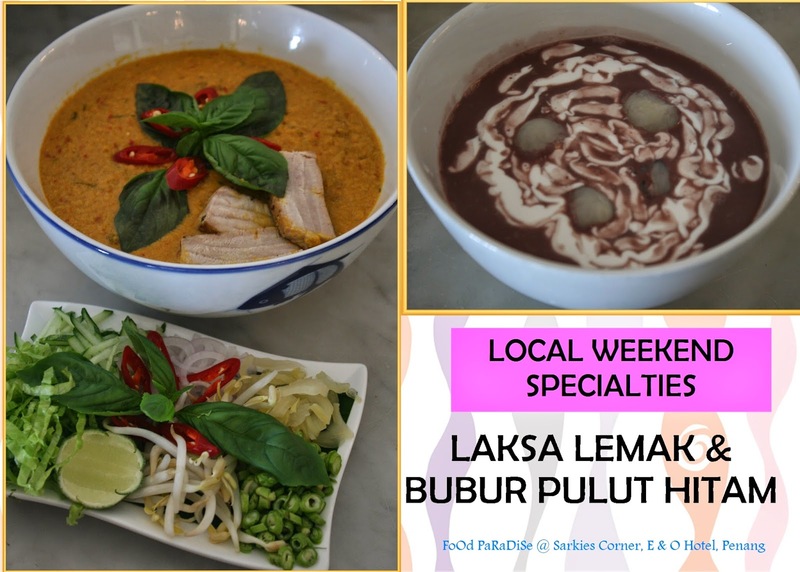 Are you the lemak laksa fans? If you are, you will definitely like this. It is very lemak and spicy. 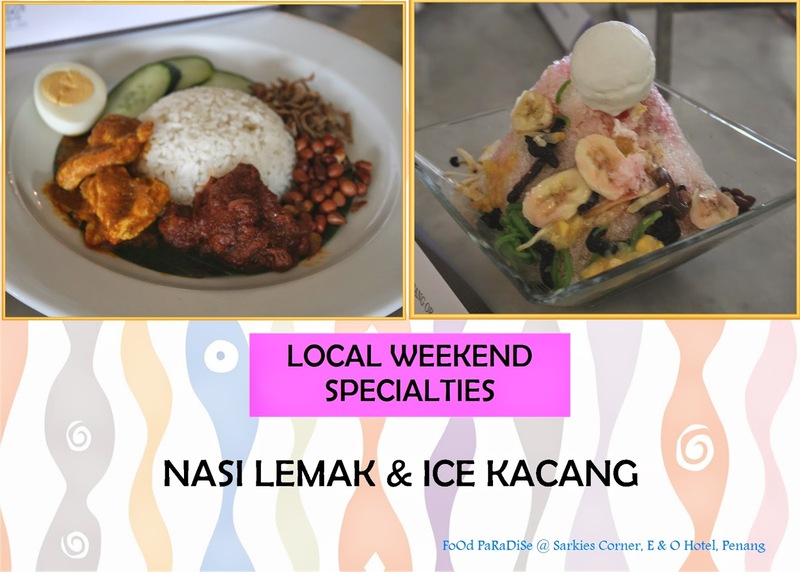 WEEKEND LOCAL SPECIALTIES IS ONLY APPLY ON EVERY SATURDAY AND SUNDAY. FROM 12 NOON TO 3PM. 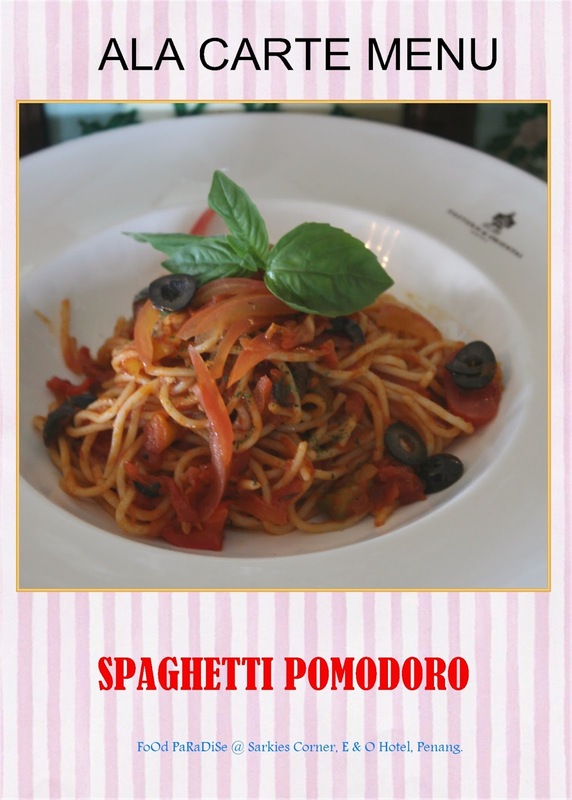 COST: RM 20++ PER DISH. 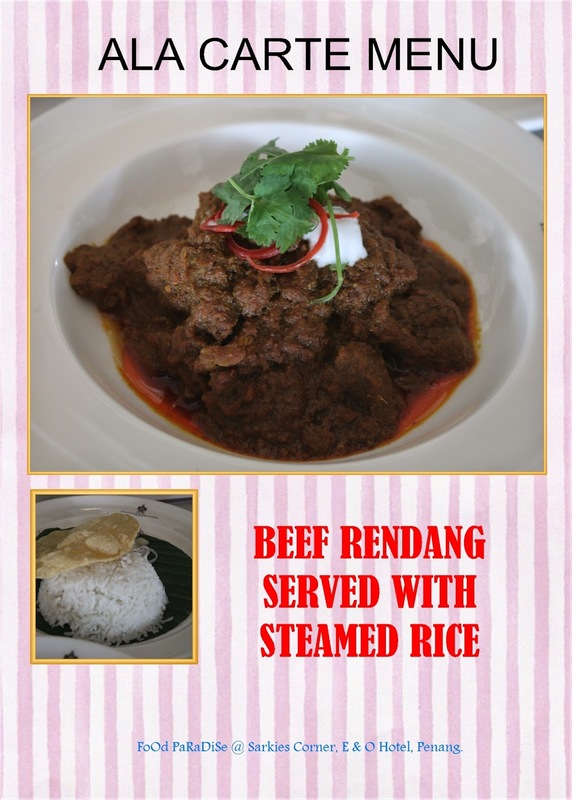 It is basically local spices beef stew with coconut milk, chilli and lemongrass. Fried yellow noodle with prawn, chicken meat, chicken egg, bean sprout, bean curd, potatoes and peanut sauce. 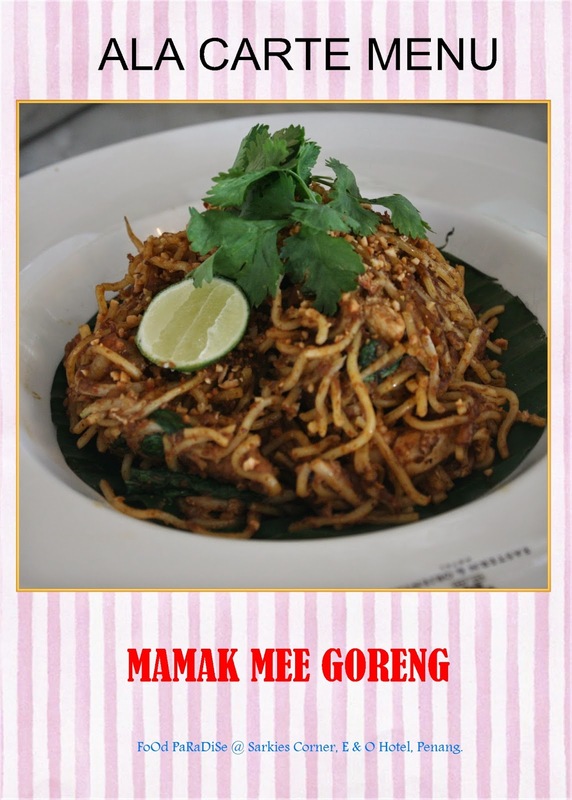 I quite enjoy this mamak mee goreng as it has a rich aroma of peanut sauce use. 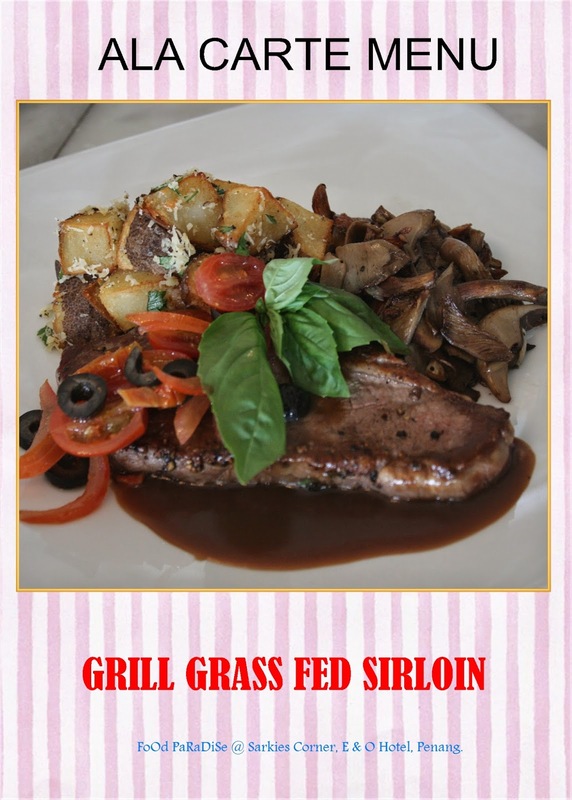 Grill beef served with wild mushroom ragout, tomato relish and shallot sauce. 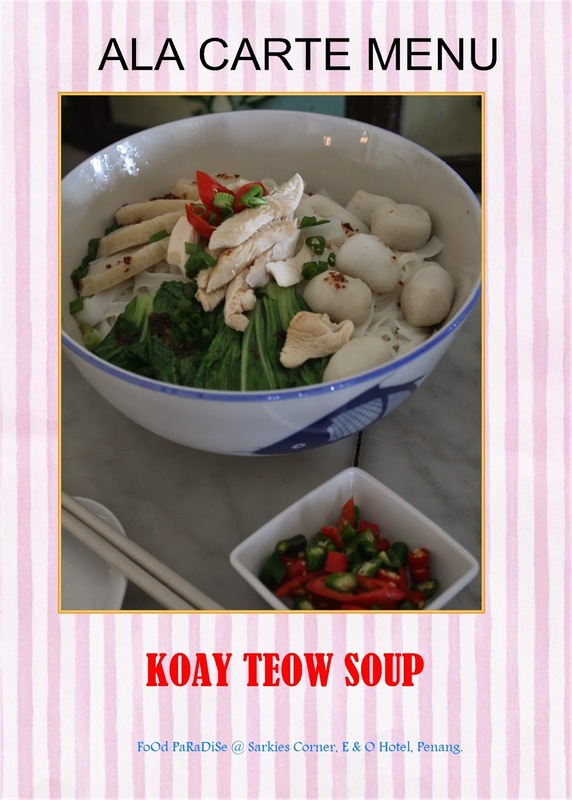 Flat rice noodles served with rich chicken broth, fish balls, fish cakes, chicken meat and choy sum. 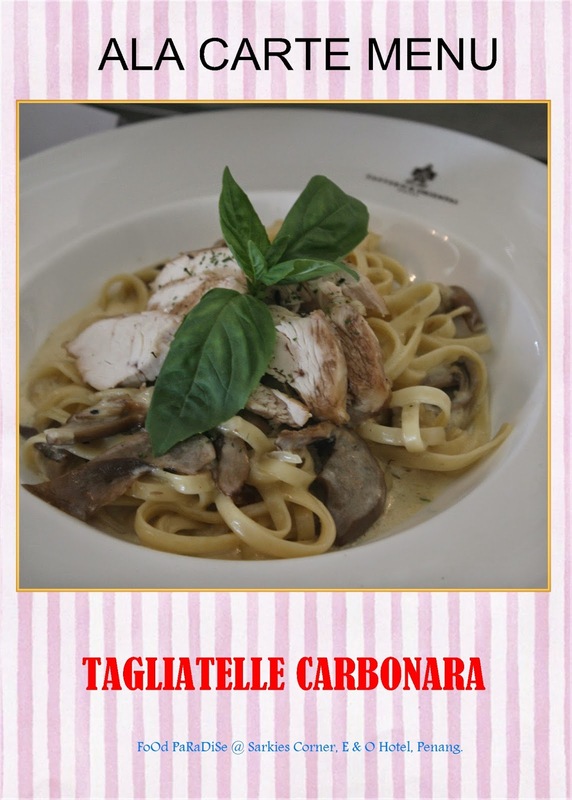 Tagliatellie served with roasted chicken breast, mushroom and cream. You can choose to use chicken egg or duck egg for this the Char Koay Teow. I usually will opt for the duck egg as I feel that it is more favourable. 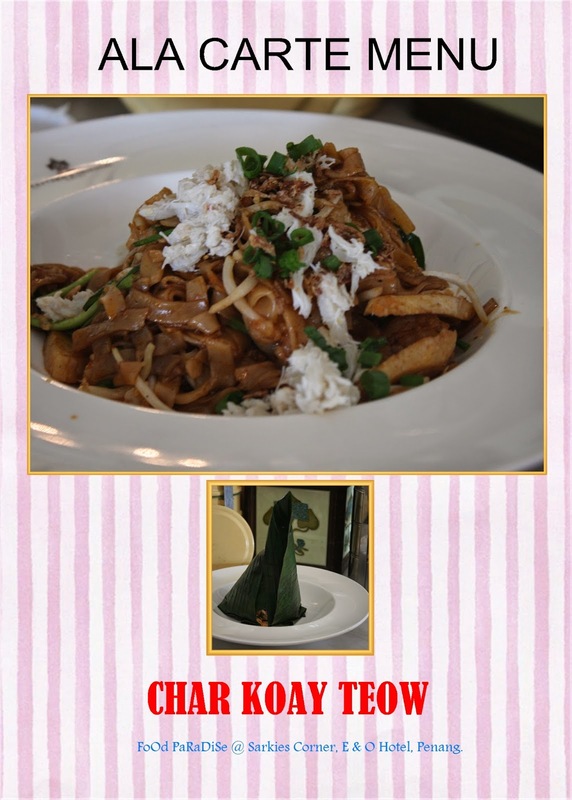 The Char Koay Teow was presented with cone shape wrap with banana leave. When being served, they will just open right in front of you. It's like you are waiting for something special to review. 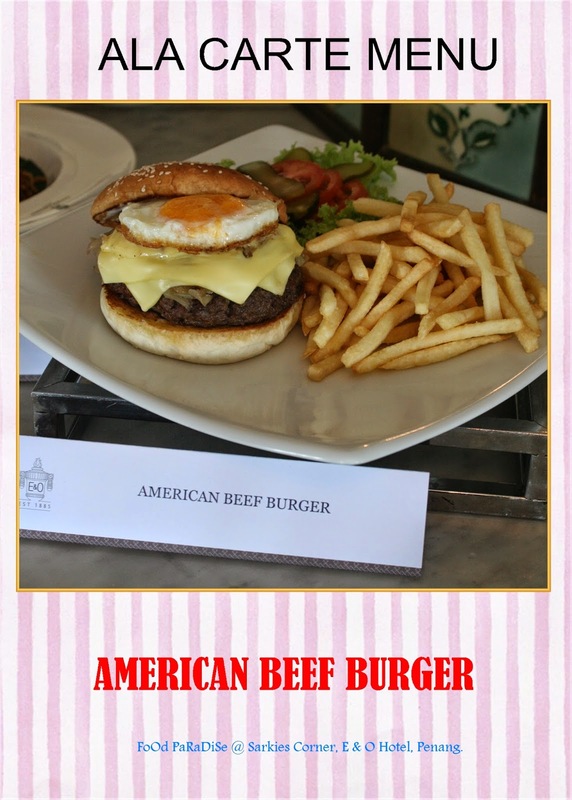 It consists of Cheese, mayonnaise, tomatoes, cucumbers, onion rings, gherkins, lettuce, chicken egg, beef and served with sesame seed bun plus French fries. 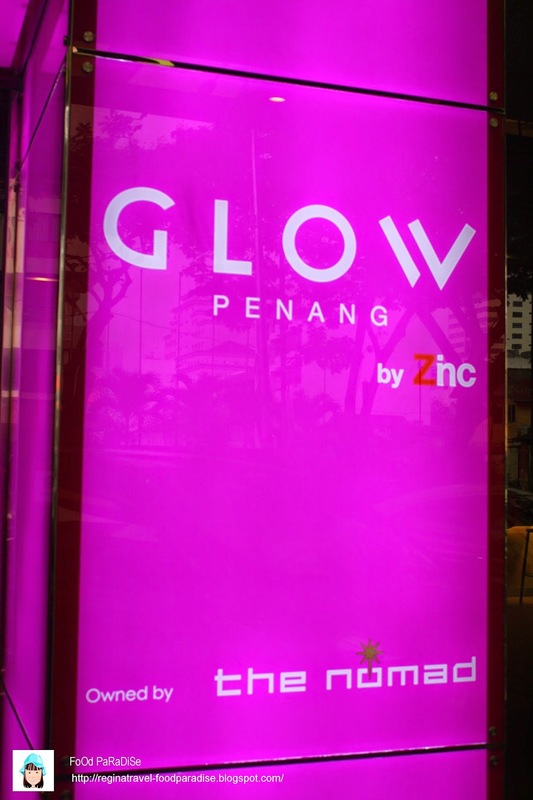 Address: 10 Lebuh Farquhar, 10200 Georgetown, Penang. 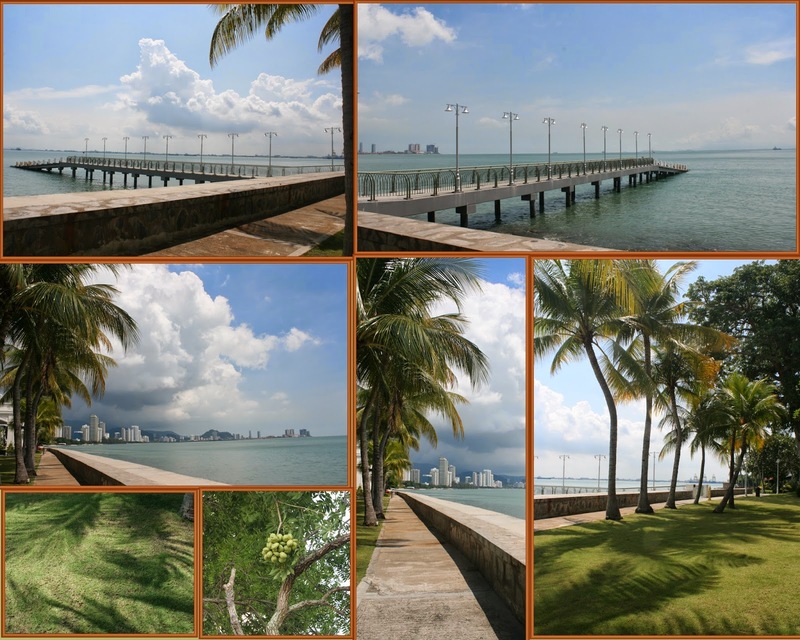 To wrap up my blog, I would present you the following collage shots of E & O scenery. It is quite a nice strolling place after coffee break/weekend local specialties or any ala carte food from the menu. Sometime, it's good to stop, sit back and just relax!